Dallas-based multi-media creative studio Flight School teamed with American rock band Umphrey’s McGee’s to help promote their first triple-header at Red Rocks Amphitheatre with an exclusive mind-bending “Augmelted Reality” poster that fuses Flight School’s technological expertise and the band’s artful aesthetic. The AR technology digitally brings the vibrant colors and kaleidoscopic artwork to life through a mobile app, sparking psychedelic-induced level visuals atop the new poster. Within the app, viewers hold their camera over the artwork and turn up the volume to begin an artful trip of colorful movements, crafted in sync with the band’s music. The online consumer pre-order of the Augmelted Reality poster sold out within minutes of its release and is a prime and early example of how AR technology can be leveraged in music marketing. 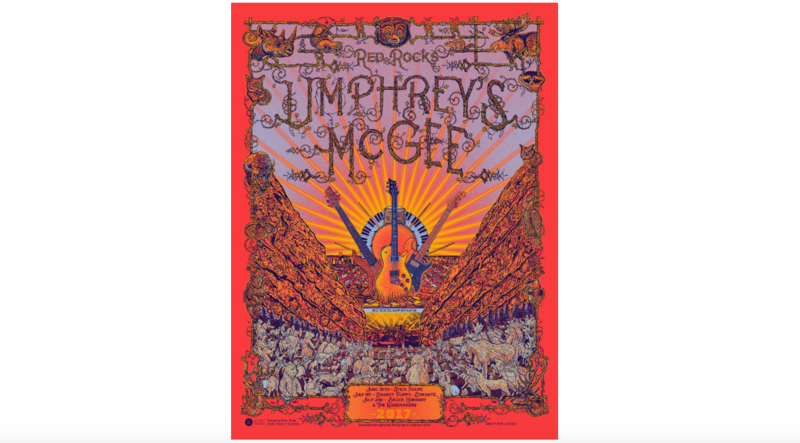 Additional posters were available at the band’s three Red Rocks shows on June 30 – July 2. The app is available on iOS HERE and Google Play HERE. Augmented reality is on a fast route to wide adoption and this app paves the way for the future of marketing in the music industry. Umphrey’s McGee Manager Kevin Browning is constantly seeking innovative ways to promote the band, including the 360 video concert for their 2016 tour created by parent studio Reel FX. Flight School’s creative tech team leveraged their extensive expertise in creating groundbreaking experiences and installations to introduce the most fitting form of AR to a very niche crowd. The AR technology was created through Unity game engine and illustrated in Photoshop, which was used to create hundreds of tracking marks on the artwork. Flight School Studio is a multi-media creative studio with award-winning expertise in developing and producing high quality, ground-breaking VR and AR content. Flight School represents the combination of the emerging tech team from Reel FX Creative Studios and the creative leadership of Moonbot Studios. This combined force has been responsible for over seventy activations in VR, AR and 360 video and has been a first mover in these emerging technologies. Flight School boasts one of the world’s largest portfolios of completed projects for a loyal base of blue chip customers including hardware manufacturers, major consumer brands and major media outlets. The company’s creative leadership team has won awards including an Oscar, multiple Emmys, Clios and Cannes Lions. By merging the best of storytelling with cutting edge technical expertise, Flight School presents boundless opportunities for the creation of world-changing experiences.